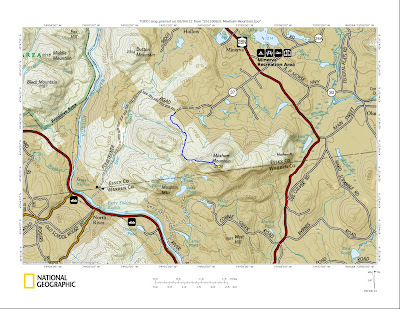 Last week I had heard from The Gear Source in North Creek that a new DEC trail trail had opened up on Moxham Mountain in the Adirondack town of Minerva. A new trail! How exciting. That meant we had to move it to the front of trails to hike. With that being said, we started my Labor Day weekend last Friday with a trip up Moxham. 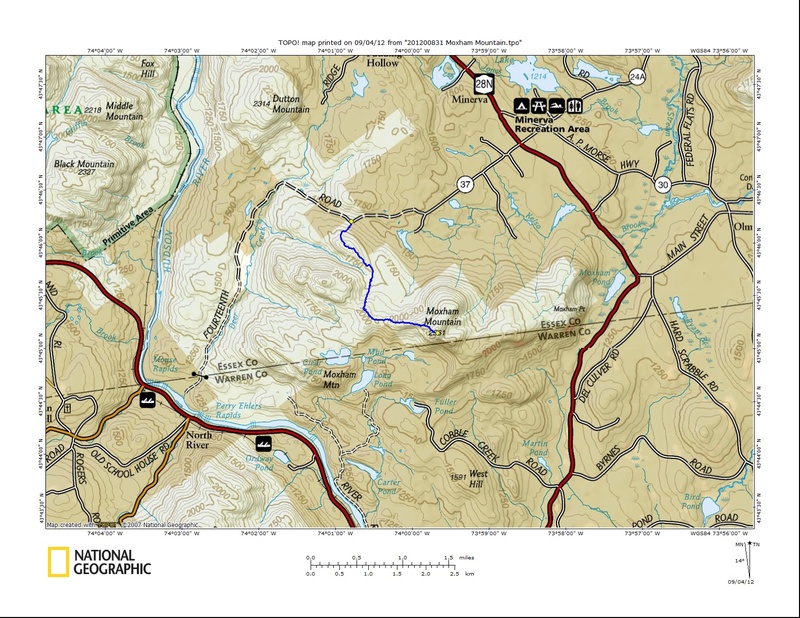 The Unit Management Plan for Vanderwhacker Mountain Wild Forest, Appendix J, summarized the thinking behind the trail. Page 2 of the Appendix showed a proposed route. Perfect. We arrived at the trail head at about 10:30. No one was parked there. We started up the trail which has been marked with yellow disks, but all the pink flagging tape still remains from the route planning. The trail head is at 1540'. The trail rises gradually to 1900' before dropping back down to 1725'. After the drop, the trail follows a consistent moderate grade the rest of the way to the summit. There are a couple early views before the trail ducks from the ledge back into the trees. After a little while, the trail returns to the ledges and there are many nice views along the way. From the summit there is a 180 degree view south and from east to west. In the summit rock are 3 USGS markers and some hardware from an earlier structure. The trail ends at the summit high point. The ridge continues to the east, but the high points along the ridge are in and out of public land. We enjoyed the summit for awhile before returning to the trail head. We saw one couple climbing as we neared our car. This trail would be an easy snowshoe hike and I believe some views to the north would be obtained once the leaves are off the trees. The footing on the trail is soft. As the forest floor has not yet had any wear. There are some little sapling stubs sticking up an inch or two on the trail so be careful you don't trip on those. Otherwise, it's a nice enjoyable hike. The grade never gets that steep, so you don't have to work to hard to reach the summit. There is no water along the trail, so be sure to bring some with you. 3 USGS markers on the summit... and they all say "Maxam"
The route can be viewed at Every Trail. You have "There footing on the trail is soft forest floor" and it seems like it should just be "the". Anyway, I actually drove through North Creek this weekend while I was visiting Hannah. We went to Lake George actually too. It would have been funny if we had driven past you haha. Glad you did this hike Mike, I've been interested since I first heard about the new trail a couple weeks ago. It will definitely be added to our list of possible family hikes. At the far eastern end of Moxham's ridge is a dramatic example of exfoliation - looks more like rock you'd see in Yosemite than the Adirondacks. The cliffs are very visible from 28N. I had done some rock climing there years ago - the crag was known as Moxham Dome - but access is no longer allowed as it is on private land. Apparently the property line cuts diagonally through those huge granite slabs, so the base of the climbs is on private property but the upper portion is on state land. Perhaps someday access will again be allowed. I was tipped off to this by someone in the ADK forum. Looks great. Looks like the perfect excuse to go to Gore for the weekend for some skiing and snowshoeing. It's a great trail. I want to see it sometime in winter. Thanks for reading!